James Lick, the "Generous Miser"
He was an honest, industrious man, of much common sense, though noted for many eccentricities and whims and in his later years, of irritable and thoroughly disagreeable temperament....His great and well merited fame rests on the final disposition of his millions, which after provision for his relatives, were devoted to various scientific, charitable, and educational enterprises for the benefit of the donor's adopted state. "A telescope superior to and more powerful than any telescope yet made ... and also a suitable observatory connected therewith ..."
The Story of Lick Observatory begins at a time of rapid change in the American West. The new transcontinental railroad had only recently linked the young state of California to the established centers of science and commerce in the East. The Gold Rush had left a profoundly changed economy in its wake. Fortunes had been made, and among those who had reaped the wealth was a thrifty Pennsylvania Dutchman who had found gold not in the foothills of the Sierra Nevada, but in the booming real estate market fueled by California's unprecedented growth. Even as he lay dying in the sumptuous San Francisco hotel he had built, James Lick was issuing final orders for the disposition of his fortune. His largest single bequest would be for construction of the astronomical observatory that bears his name. The telescope he envisioned - part high- visibility scientific enterprise, part monument to himself - was to be second to none. But first, Lick's own extraordinary story, from Pennsylvania woodworker to California millionaire, bears telling. Some day, I will own a mill that will make yours look like a pigsty! James Lick was born in Stumpstown (now Fredericksburg), Pennsylvania, on August 25th, 1796, the eldest of seven children. His father was a skilled woodworker and on his thirteenth birthday James became his apprentice, learning carpentry and cabinetmaking under the master's stern and demanding tutelage. He was a quiet and obedient pupil who, despite any inward resentment he may have harbored against his father's severity, strove to achieve the excellence that was expected of him. In time, his skill became equal to that of his teacher's. "He had been keeping company with a girl named Barbara Snavely for some time. She was the daughter of a local miller and farmer. James was very much in love with Barbara. One day, she confided to him that she was pregnant. He became very concerned and planned to do the right thing by marrying her immediately. However, when he talked to her father the next day, and asked his permission to marry Barbara, Henry Snavely was indignant at the very idea of a young apprentice joiner having the temerity to ask for his daughter's hand in marriage. An angry James strode from the house, but before he left, he shot back at the haughty miller, 'Some day, I will own a mill that will make yours look like a pigsty!'" Following his disappointment, Lick left Stumpstown. He found work in Baltimore where he learned the art of piano making, and before long set up his own shop in New York. 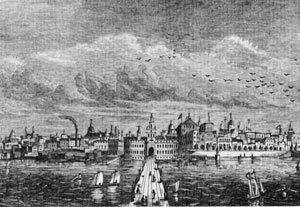 In 1821, after learning that his pianos were being exported to South America, Lick packed his tools, his workbench, and his few belongings, and sailed for Argentina, reasoning that by taking himself to the market he could more quickly build the fortune he needed to win the hand of his beloved Barbara. Lick's South American years - nearly thirty in all - were prosperous and colorful ones. He established his first workshop in Buenos Aires where his honesty and fine craftsmanship soon placed him in high regard. The business prospered despite chronic - and often violent - political turmoil. At first Lick found his new life difficult. He was frequently ill and was handicapped by his lack of Spanish. He had arrived during a particularly unstable period and was unhappy witness to bloody uprisings in the city. In 1825, even with his business thriving and command of the language attained, Lick wrote to his father that he was "one minute in the clouds of heaven and the next in the depths of the sea and death always before my eyes in ten thousand forms. This is far from peaceful living", he continued, "and I would not wish it on my worst enemy." That same year, leaving his business in the hands of a trusted man, Lick left for a year's tour of Europe, hoping to regain health and peace of mind. On the return voyage, his ship, after nearly sinking in a fearsome storm, was captured by a Portuguese Man-o-War as it approached Buenos Aires. Passengers and crew were taken to Montevideo (in present-day Uruguay) as prisoners of war. Lick's daring escape on foot finally brought him home, where he found his business much in need of attention. Lick immediately set about reestablishing his fortune. He soon restored his piano business to its former prosperity, and began a lucrative trade in furs. By 1832 he felt that he had accumulated enough money to make the long hoped-for trip back to Stumpstown, to at last claim the bride he expected to find waiting. However, despite the $40,000 he carried, Lick saw neither his would-be bride nor his son. On hearing of her old lover's imminent return, Barbara, who had married another man only two years after Lick's departure, had taken their son John and left Stumpstown. Though James had corresponded with his family, he had apparently not communicated his intention to return for Barbara, and no one had informed him of her marriage. Disheartened, Lick returned to Buenos Aires, but with revolution threatening, soon moved to Valparaiso, Chile. Four years later, again to escape the clouds of war, he moved to his third and last South American home: Lima, Peru. As before, his high standards established his good reputation and his services were soon in great demand. Lick spent a prosperous decade in Lima, but by 1846 he had made up his mind to return to North America. Always an avid reader of newspapers and observer of the political scene, he had watched the dispute between Mexico and the United States over Texan sovereignty arise, and had concluded that war was inevitable. Lick fully expected a U.S. victory and with it the annexation of California, a territory rich with opportunity for a man with vision - and capital to back it. Once having made up his mind, Lick was anxious to leave, but his mostly Mexican workers had quit to fight in the war which had broken out in April of 1846, leaving him with a dozen unfilled orders. In characteristic fashion, Lick remained in Lima another eighteen months, finishing the pianos with his own hands. 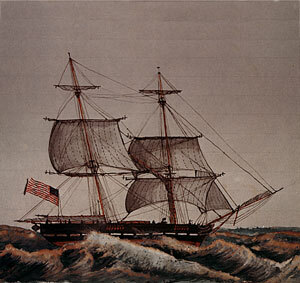 Finally, his obligations discharged, he sailed for California on the brig Lady Adams in November, 1847. San Francisco at about the time of Lick's arrival. Lick looked at the hills and mudflats of the little shanty town with its thousand inhabitants and fine natural harbor, and saw in it a thriving city and a center of commerce. He at once began to turn his cash into land. He bought shrewdly and without hesitation, acquiring thirty-seven lots by mid-March. Lick's unprecedented buying spree was the talk of San Francisco, and surely many locals, thinking him a bit touched, must have been only too glad to take his money. What Lick and his fellow San Franciscans could not have foreseen was an event which would change the course of California history and completely reshape her economy. 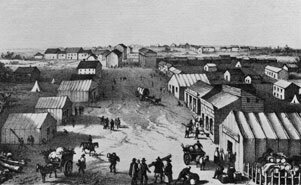 The discovery of gold at Sutter's Mill, only seventeen days after Lick's arrival, would soon give rise to a boom which catapulted San Francisco's population to twenty thousand in the next two years. Even the conservative Lick was infected with gold fever, but a week in the mud of the gold fields convinced him that his future lay not in the glittering metal beneath the soil but in the land itself. By prompt and judicious investment he was able to purchase sizeable real estate holdings at a time when many residents were anxious to sell in order to seek treasure in the gold-laden foothills. This "buyer's market" allowed Lick to purchase more land than he might otherwise have done. While luck certainly played a role in creating these circumstances, Lick possessed the intelligence, courage, and capital to take full advantage of the opportunity. Now in his mid-fifties, tall, vigorous, and stern, his strong face framed with a severe beard and a head of thick dark hair, Lick was an imposing figure. As his wealth and holdings increased, his interest turned more and more to the land. He left the management of his San Francisco properties to an agent, and focused his attention on a large tract of land he owned near San Jose. He gave rein to his gift for horticulture, transforming his orchards into some of the finest in the state and selling produce to the hungry residents of San Francisco. Lick mill, Santa Clara, CA. Though 37 years had passed since Lick's angry confrontation with Henry Snavely, Lick had not forgotten his bitter promise to the miller. Along the banks of the Guadalupe river, he built the mill that would make Snavely's "look like a pigsty." Lick did much of the work himself on the lavish $200,000 project, which came to be known, for its extravagant use of the most costly machinery and the finest woods, as "the Mahogany Mill" and "Lick's Folly." 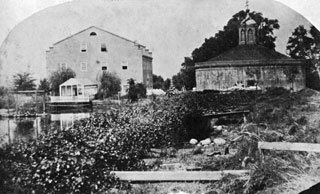 When the mill was finally completed in 1855, Lick had it photographed and copies sent to Stumpstown. Though in all likelihood Henry Snavely was dead by that time, this did not stop the proud Lick from making good on his promise of thirty-five years before. That same year Lick sent for his son John, who, at thirty- seven, had never met his father. He brought with him the news that his mother, Barbara, had died four years before. John remained with his father for eight years, but the relationship was not an easy one. Though Lick made his son manager of the mill, he thought him irresponsible and without ambition. At first, Lick and his son shared a small cabin. In hopes of improving their relationship, Lick built a colonial mansion with a marble fireplace in each of its 24 rooms, but, to his great disappointment, John preferred the simplicity of the cabin. Soon Lick himself lost interest in the project. He never furnished the grand house, sleeping instead on an old door propped between two nail kegs, and drying fruit from his orchards on newspapers spread in the empty rooms. In 1863, John went back to Pennsylvania, returning only when his father was on his deathbed. Though known - and sometimes criticized - for his austere personal habits, Lick was capable of vision on a grand scale. Late in 1861 he began work on a hotel in San Francisco that came to be regarded as the finest west of the Mississippi. 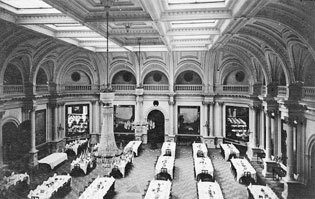 The dining room, with its seating for 400, was modeled after one which Lick had seen 35 years before in the palace at Versailles. Lick meticulously cut and placed much of the exquisite wood inlay in the dining room with his own hands. The magnificent hotel, known as Lick House, was destroyed in the great San Francisco fire which followed the earthquake of 1906. Another of his grand enterprises - a replica of the iron and glass conservatory in London's Kew Gardens which he had ordered from an East Coast firm - was intended as a gift to the city of San Jose, but when Lick read an article in a local newspaper criticizing his characteristically shabby dress, he withdrew the gift, never opening the crates in which it had arrived. After Lick's death, the impressive structure was purchased by a group of San Franciscans who assembled it in Golden Gate Park where it still stands as the beautiful Conservatory of Flowers. Lick was widely known for his eccentricity. He showed little interest in his own comfort or appearance. He was laconic and taciturn and rarely felt the need to explain himself to those around him. He was known to test the obedience of his workers by assigning such tasks as planting trees upside-down. He enjoyed showing off his orchards and flowers to visitors, but once, overhearing one of a group of young ladies remark that she had seen prettier violas in San Francisco, he stranded them in a field, leaving them to find their own way home. He could be both generous and miserly, thoughtful and inflexible. Though he had invited his son to share his life and fortune, he later all but cut him from his will, citing John's neglect of his pet parrot. He is said to have offered a 60-acre field to a stranger for the cost of the fence, but when the man took a day to decide, Lick told him that because he had wavered he could no longer have the land at any price. Despite his eccentricities, Lick is best remembered for his strong will and determination, his ambition and drive, his honesty and generosity. Yet there lingers about the edges of these harder qualities, a shade of resignation, even fatality. Once, while carrying an ox-yoke on his shoulders, he was overtaken by a friend with a horse and wagon who offered him a ride. Lick thanked the man but declined. His friend then asked if he wouldn't at least put the heavy yoke in the wagon. "So far in life", he replied, "I have born my yoke patiently, and I will not shirk my duty now". One evening in his 77th year, alone in the kitchen of his Santa Clara homestead, Lick collapsed from a severe stroke. In the morning he was found, alive but helpless, by his foreman, Thomas Fraser, a man who, years before, had earned a job by unquestioningly following Lick's orders to stack and restack a pile of bricks in the rubble of a burnt house. Lick lived another three years, but never completely regained his health. His estates now included, in addition to many properties in San Francisco and the Santa Clara Valley, holdings on the shores of Lake Tahoe, a huge ranch in Los Angeles County, and all of Santa Catalina Island off the southern California shore. He was among the richest men in a state noted for its riches. Lick's infirmity forced him to move to a room in his San Francisco hotel, where he could be more easily cared for. It was there that he turned his attention to the disposition of his fortune, formulating a variety of bequests ranging from public baths to a home for aging widows, from a generous donation to an orphanage to one for the prevention of cruelty to animals, from the foundation of a vocational school to monuments honoring his parents and grandfather. Never far from his mind, however, was the monument he wished to leave to his own memory. At first, Lick wanted to set aside a million dollars to erect enormous statues of himself and his parents, so tall as to be visible far out to sea. This plan was abandoned when a friend pointed out that the monumental statues would make vulnerable targets in the event of a naval bombardment. The scheme was replaced by an even grander one: a pyramid, larger than the Great Pyramid in Egypt, to be built in downtown San Francisco upon a block which he entirely owned! But, to the lasting benefit of science - if not to the San Francisco tourist trade - Lick's thoughts were turned from pyramids to telescopes. Several persons have been credited with sparking Lick's interest in the stars and steering him in the direction of building an observatory. According to legend, in 1860, Lick had met a student of astronomy and itinerant lecturer named George Madeira who had talked to him of the heavens and impressed him with views through his small telescope. Madeira is reputed to have told Lick that "If I had your wealth ... I would construct the largest telescope possible to construct". 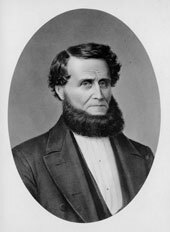 Joseph Henry, Secretary of the Smithsonian Institution, who had met Lick in 1871, also claimed to have guided him towards a major scientific bequest by holding up the example of his institution's benefactor, John Smithson. But the single person most responsible for Lick's eventual decision to build an observatory was his friend George Davidson: astronomer, geographer, and President of the California Academy of Sciences. Davidson often visited the ailing millionaire in his room at Lick House, and in the course of their conversations, gently led him to the idea of his greatest monument. They discussed science, astronomy, the planets, the rings of Saturn, and the mountains on the moon. Their talks soon veered to telescopes, and before long Lick decided to forego his pyramid and instead give his fortune for a telescope 'superior to and more powerful than any telescope yet made.' (from Eye on the Sky, Osterbrock, Gustafson, and Unruh).